SACO—The lone run in Windham’s road bout vs. Thornton Academy on May 3 came in the second inning – and it belonged to the Eagles. Derek Foss belted the fateful ball, bringing home Tanner Bernier for a 1-0 lead that eventually turned into a 1-0 win. Eagles leadoff hitter Brady Afthim singled to begin the game, then stole second on teammate Cam McCartney’s at-bat. McCartney struck out to TA starting pitcher Cam Seymour, however, as did his two followers to the plate, Bryce Afthim and Chris Naylor. Bryce Afthim, the Eagles’ own starter on the mound, struck out the first TA batter he faced, Luke Chessie, then lured Chessie’s fellow Trojans Matt Merrill and Brogan Searle-Belanger into a 4-3 groundout and a 6-3 groundout, respectively. Perhaps the biggest story to come out of the contest was Windham’s collective defensive effort. The team turned in some spectacular plays, after all. Afthim successfully covered first for Ryan Sargent in the bottom of the fourth, for instance, completing a 3-1 groundout Sargent had to jump away from the bag to grab. Then, in the bottom of the sixth, the Eagles really retired the Trojans in style. Brady Afthim, catching for his big brother, grabbed an attempted TA sac bunt for the first out of the stretch, whirling and hurling to Sargent in the nick of time. Next, the elder Afthim repeated his earlier maneuver: Sargent managed to knock down a hard Trojans shot in his direction, but had to dive off base to do so and couldn’t regain his footing in time to get back to the bag; luckily, Afthim was there to reel in the toss. Two outs. Finally, Foss, a reliable force in rightfield for the team, closed out the inning with a spectacular diving catch on a TA shot – a low, hard, shallow flyball, almost a line drive. Foss’s catch was particularly important, as a hungry Trojan was headed for home when he made it. Windham earned the game’s only run after Bernier walked onto base to kick off the top of the second. Bernier stole 90 feet during Kyle Herzig’s at-bat. When Herzig then took off for first on a dropped third strike and Trojans catcher Calvin Chistoforo misfired the ball to his baseman, sending it a bit high, Bernier dashed on over to third. Foss’s drive single to right scored Bernier for 1-0. The scoreboard never changed after that, though Windham did come close to notching a second run in the top of the sixth. Once again Bernier reached base, this time on an error at third. He rounded almost all the way to home when Herzig followed him into the batter’s box and blasted a ball to deep centerfield. The Trojans, however, caught Bernier out at the plate with a mile-long, 8-2 throw. For his part, Herzig made it all the way to third on the hit, though (obviously) he never made it any further. The victory bumped Windham to 3-2 on the spring. The Eagles picked up another win the following day, slipping past Cheverus 3-1. They traveled to Sanford on Tuesday the 8th, winning 13-1, and welcomed Massabesic on Thursday the 10th. The team travels to Bonny Eagle on Saturday the 12th. Windham currently sits in second in A South. Portland occupies first and Noble third. 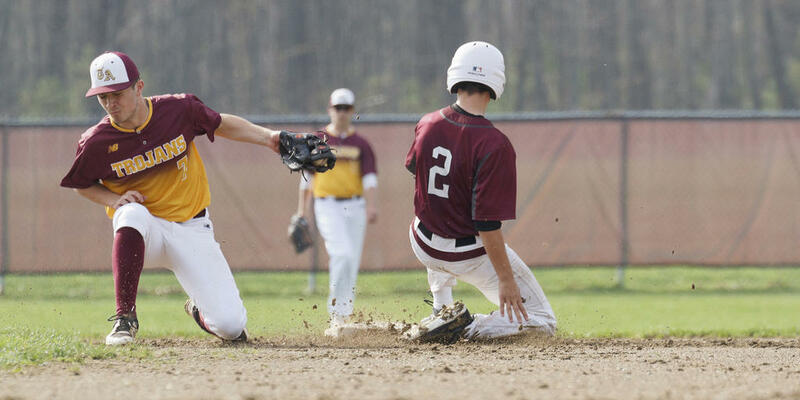 Windham runner Brady Afthim slides into second on a steal, just ahead of the throw to Trojans baseman Luke Chessie. Kyle Herzig fields a ball for the Eagles in their narrow win over TA. Windhamite Tanner Bernier, leading off third, watches a ball sail high into the air off the bat of teammate Derek Foss – watches and waits, presumably hoping for an opportunity to break toward home. Kyle Herzig Hungers for home plate. Windham pitcher Bryce Afthim threw a four-hit, three-strikeout, complete-game shutout vs. TA last Thursday. Windham rightfielder Derek Foss (right) celebrates with centerfielder Cam McCartney after Foss’s spectacular diving catch to end the sixth inning on Thursday. Nick Kilgallon arrives home – a hair too late – for the Eagles in the top of the seventh on Thursday. There was some controversy on the second half of the play, which ultimately resulted in a strange double-play and Windham’s runner at third being called out as well. Windham shortstop Tanner Bernier reels in a throw in hopes of tagging out a TA runner.